As diners relaxed for their evening meal on one of the last days of Ramadan, the gunmen burst into the restaurant before separating foreigners from locals so they could launch their killing spree. But he detailed to his father Rezaul how the gunmen -- who were armed with automatic weapons, bombs and makeshift machetes -- had split the diners into two groups. "(The foreigners) were taken to the upper floor and the Bangladeshis were kept around a table," said Rezaul Karim. Read more from the Than Thien news [HERE]. Seven militants who killed 20 people at a Dhaka restaurant made no demands and a person taken alive by police was only a suspect admitted in hospital, Bangladesh's home minister said on Sunday, rejecting Islamic State's claims of responsibility. ...Gunmen singled out foreigners as soon as they stormed through the doors of the restaurant popular with expatriates. They ordered all Bangladeshis to stand up before the killing began, a source briefed on the investigation said. Read more from Reuters [HERE]. 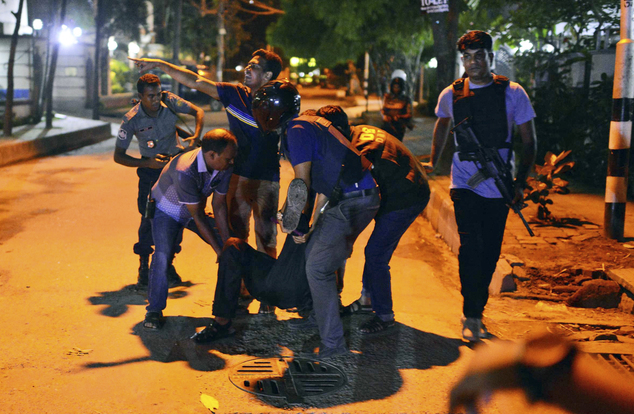 Nine Italians and a US citizen were among the 20 people hacked to death when a group of Islamic State (Isil) terrorists burst into a restaurant popular with foreigners in the Bangladeshi capital of Dhaka. A group of seven attackers armed with blades, guns and bombs also murdered seven Japanese, two Bangladeshis and one Indian citizen before army commandos stormed the Holey Artisan Bakery and brought an end to the slaughter. Read more from the Telegraph [HERE]. Emory University says two of its students were among 20 victims of an extremist attack in Bangladesh. The confirmation brings the American death tally to three, after a University of California-Berkeley student was also counted among the dead. DHAKA, Bangladesh (AP) — The hostages were given a test: recite verses from the Quran, or be punished, according to a witness. Those who passed were allowed to eat. Those who failed were tortured and slain. ..."The gunmen asked everyone inside to recite from the Quran," the Islamic holy book, according to Rezaul Karim, describing what his son, Hasnat, had witnessed inside. "Those who recited were spared. The gunmen even gave them meals last night." ..."All the hostages were killed last night. The terrorists used sharp weapons to kill them brutally," said Brig. Gen. Nayeem Ashfaq Chowdhury of the Army Headquarters in a news conference Saturday night. If the video does not play below, view [HERE].